American Forces Network listeners and viewers can expect to lose service for up to 20 minutes at a time due to daily sun interference expected to last until March 7. Sun outages occur when the sun passes directly behind a satellite. Because the sun is far more powerful than a satellite, the sun’s energy briefly overpowers the signal when a satellite is directly between the receiving dish and the sun. 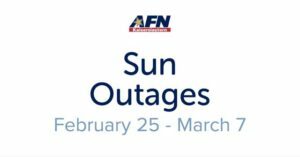 This spring, AFN expects daily sun outages to take place between between Sunday and March 7. These outages can last from 10 to 20 minutes and will affect AFN radio and television services both on base and off. AFN listeners and viewers that do not regain service after 30 minutes can contact the AFN Broadcast Center Helpdesk at +1 (951) 413-2339 / DSN (312) 348-1339 or sathelpdma@mail.mil for assistance.